Get security that keeps up with your life. Your smartphone has more in common with your computer than with your old mobile phone. Criminals know you're literally carrying a small PC in your pocket and will do all they can to access your personal information. Following a few simple steps you can dramatically reduce your risk of having your money and identity stolen. See the tabs below for suggestions. To protect the security of your U.S. Bank and/or U.S. Bancorp Investments account, we’ve expanded our authentication options to now include ﬁngerprint scan, one-time passcode, visual pattern and facial recognition. First, follow the recommended steps of your mobile service provider to report a lost or stolen phone. If you’re using the new U.S. Bank Mobile app, there’s no need to contact us or change your Personal ID or Password. When you get your new phone, download the new app or sign in to the Mobile Web to continue your mobile banking. If you're using Text Banking call 800.US.BANKS (800.872.2657) or log in to Online Banking and choose “Text Banking” to cancel Mobile Banking services for that phone or device. As always, you'll want to monitor your accounts for suspicious activity. If you notice anything that concerns you call us right away at 800.US.BANKS (800.872.2657). Make sure you have antivirus software installed on your device. If you visit the U.S. Bank website using your phone, delete the cookies and cache regularly. Better yet, use our dedicated apps for online banking. Always visit the U.S. Bank Mobile Banking site to verify the sources of your online banking applications. If you’re considering adding an app to your mobile device, review the app’s permissions so you understand what the app is capable of doing before you decide to download it. Due to the small screen size in smartphones, it’s even harder to spot whether a link is legitimate. If you need to access a website, type in the address yourself. Learn More. Don’t rely on carriers, recycling firms or phone deposit banks to “clean” your phone before disposal or resale to third parties. Follow your phone manufacturer’s instructions to remove all personal information from your phone before decommissioning it. Whether it's at your favorite coffee shop or even your local gym, complimentary Wi-Fi access is frequently available. Although a nice service, unsecured networks may allow hackers to distribute malicious code to your devices or even intercept your personal details. Don't turn your Wi-Fi on if you don’t actually need to use it. Even if you’re not actively using the Internet (i.e., logging on to websites, submitting payment, etc. ), your information can still be compromised while connected to public networks. Turn off "Auto-connect" in your settings so that your Wi-Fi does not automatically search for an open network to connect to. For an added layer of protection, enable the "Always use HTTPS" option often available on websites that require logging in. You may have heard that "jailbreaking" your device—that is, removing restrictions off your device to install unauthorized software or to customize its features—is a good idea because it allows you to use the device beyond the manufacturer’s limitations. However, jailbreaking comes with risks. By jailbreaking your device, you remove the security restrictions enacted by the manufacturer which helps to keep your data safe. Since you are able to download apps from outside your device's application store, you become vulnerable to downloading a potentially malicious app which has not been screened for malware. Go to U.S. Bank Mobile Banking and download our mobile app for quick, easy and safe access to your banking information and services wherever you go. No personal or financial information will be stored on your phone. All wireless communications are securely encrypted. Our Risk-Free Guarantee protects you from fraud loss if there's ever any unauthorized use of your account. Allow the U.S. Bank Mobile App to access your location so we can verify your Visa card and your phone are near each other, protecting your card at home or abroad. 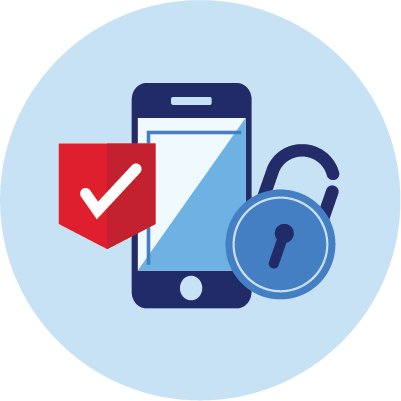 Learn more about U.S. Bank and/or U.S. Bancorp Investments security alerts.